Back in 2013, when I conceived this blog, my starting point was 10 things to celebrate about Swindon. This was a non-definitive list, in no particular order, of things that I felt worth shouting about. The list encompassed parks, public art, artists, museums and even the buses. 1) Parks, gardens and green spaces. Swindon is teeming with green spaces and is packed with park life. It’s wonderful. There’s Queen’s Park, and the Secret Garden, there’s Town Gardens and Lydiard Park to name some of the ‘biggies’ but there seems to a green area of some description practically at every turn – Hagbourne Copse being a recent-ish discovery. We are very, very lucky to live in such a green town. In that aspect at least. 2) Number 2 on my list was the arts, culture and creativity that you can find in abundance in Swindon. In the initial list I focused on the poetry bus but now, two years on, I know of so much more – it’s pretty much endless. Off the top of my head there’s Artsite and the Post Modern, the literature festival, the poetry festival, the Town Gardens artists’s group – but tons and tons more! 5) Number 5 on my list had to be Swindon treasure Ken White. Of course back then I’d heard nothing of David Bent and his fabulous work. If you think you don’t know Ken’s work – his murals aside – you absolutely do because he created Virgin’s famed red lady emblem. Banksy? Who’s he? But now I know about Tim Carroll and more besides. 6) The Museum of Computing: small but perfectly formed this is a little gem tucked away on Theatre Square. Always riding high on Trip Advisor it’s well worth a peek – geek or not. 7) The leisure facilities: I left a small village in Derbyshire to come to Swindon. It was a bus ride to the nearest town – Worksop – and then a long trek across the town simply to access a swimming pool. Everything else was Sheffield. And that, without a car, was an EXPOTITION. So imagine my delight at pitching up somewhere with a swimming pool, an ICE RINK, and a multiplex cinema just up the road! Died and gone to heaven didn’t cover it. 8) The Magic Roundabout – come on – it’s gotta be in the list! It’s featured on the blog so much it even has its own category: https://swindonian.me/category/the-magic-roundabout/ Writing about the Marmite of roundabouts for a travel writing module for my degree course helped me to a 1st – so I LOVE it. So – all of this in a town where there’s nothing to do, nothing to see, nothing goes on, nothing happens and so on. Odd then that I’ve managed to fill a blog with all that nothingness. 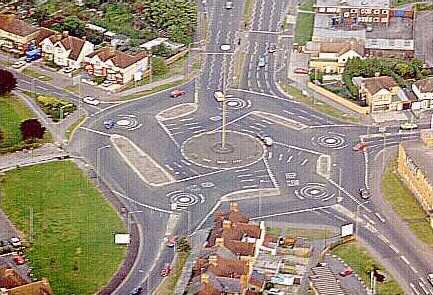 Swindon’s Magic Roundabout is the stuff of traffic legend and lore and Swindonians are very proud of it. Whether, like Marmite, you love it or hate it – well you certainly can’t ignore it. As an adopted Swindonian I share this affection for the Magic Roundabout and why wouldn’t I? It has been a rich seam of material for this blog, so much so that it has its own section on Born again Swindonian, and it even helped me to a 1st class English degree via the imagined guide-book entry I wrote about it for a travel writing module I did at university. But now this traffic guzzling behemoth has another incarnation. Lynette Thomas of Artkore Mosaics has created a really fabulous mosaic homage to the Magic Roundabout which beautifully nods at the TV programme from which it takes its name. I’m a fan of Lynette’s work and have bought a couple of her small pieces from Artsite and the Post Modern at No 9 Theatre Square so I absolutely love this piece. I like it, I want it, don’t give me any other. The mosaic Magic Roundabout is currently on display on the 2nd floor of the Central Library at Regent Circus so do go and have a look at it as my photos are not amazing – it was a bit tricky with the lights reflecting on the glass cabinet. A cake, a tart and an XTC song. A diverse set of articles is it not? Yet surprisingly perhaps there is a thematic link between them. Well two really. In the first place all three have been inspired by Swindon’s iconic Magic Roundabout, of which Swindon is very proud. Back in 1981, Swindon band XTC wonderfully conveyed the carefully controlled chaos of this car chomping contraption in their song ‘English Roundabout’. And recently my good friend Sam (@LMCakemaker on Twitter) of Little Miss Cakemaker created a Magic Roundabout cake for the Faringdon bake-off. And thirdly, the picture of the tart below, made by Mike Pringle ‘just because’ was posted in some social media interactions today regarding another link to the Magic Roundabout, the Swindon Festival of Poetry, which uses the roundabout as an emblem – well what else could it be? Well that and the pot dog – check out the profile picture on this Facebook page to see what I mean. I’ve been a passenger on the poetry bus twice now and both trips could be likened to a trip of another kind – so surreal were they. Here’s a link to the poetry festival’s own website and then there’s Domestic Cherry – which speaks for itself really. I’ve written about the Magic Roundabout elsewhere on this blog. However this piece is written from the viewpoint of a dispassionate observer producing something as if for a guide-book – something in the style of Fodors. And why not? Is that such a fanciful idea? I don’t know about you but I think it’s something of a shame we don’t have such a guide-book. Or do we and I don’t know about it? With thanks to Swindon Web for letting me use material from their website. ‘English Roundabout’ is a track from the XTC album ‘English Settlement’ published by Virgin Music (Publishers) Ltd and recorded at The Manor. Copyright © – Virgin Records Ltd. Written and composed by Andy Partridge and Colin Moulding.